If you've happened to read one of my previous reviews, you know they often start with my Saturday visit to Skyway Models, my local hobby shop, where I fail to have sufficient self control and buy, (I prefer rescue) a new kit - again. Not this time: I went on Sunday instead. Sure enough, this new peanut scale Corsair from AFV Club caught my attention. Remembering how beautifully detailed the new AFV 1/144 Sea King is and what a blast it was to build, my knees grew weak, I started to shake, and I reached for my wallet. I wasn't let down. Much like the Sea King, this is an awesome little kit with amazing inscribing and a degree of fidelity in the surface details that has to be examined closely to be appreciated. 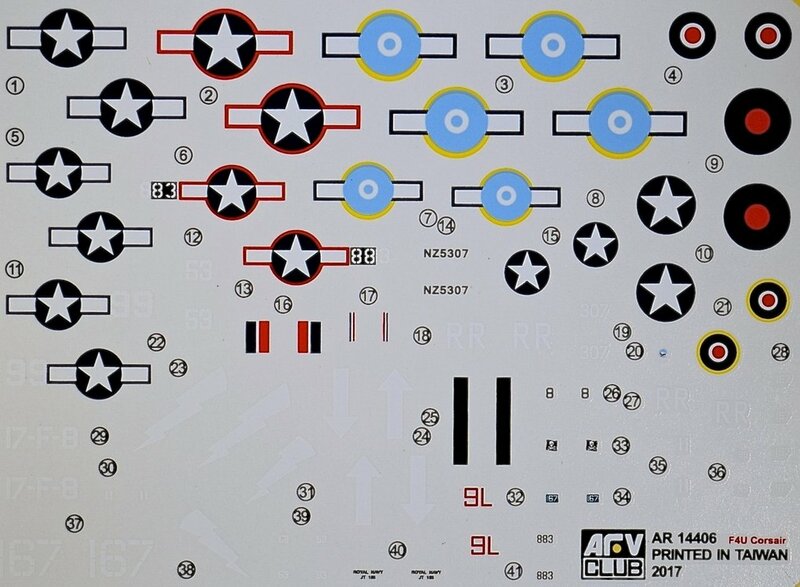 In addition to getting two complete models, the kit also provides an impressive assortment of canopy options (3) and a decal sheet featuring eight schemes. This kit is going to be a winner. The Corsair eventually served in the U.S. Navy as well as the Royal Navy's Fleet Air Arm, Royal New Zealand Air Force, French Naval Aviation, and other air forces until the 1960s. Some Japanese pilots regarded it as the most formidable American fighter of World War II: an opinion substantiated by the Corsairs' kill ratio of 11:1. 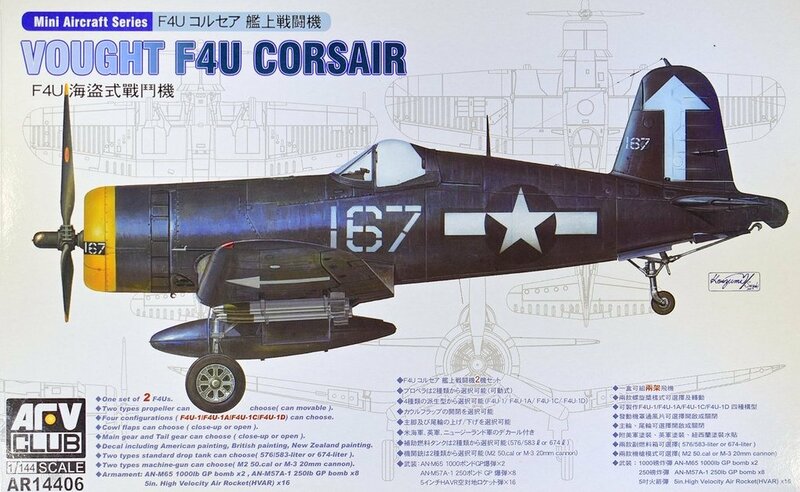 When the Corsair entered service in large numbers with the U.S. Navy in late 1944 and early 1945, it quickly became one of the most capable carrier-based fighter-bombers of World War II. 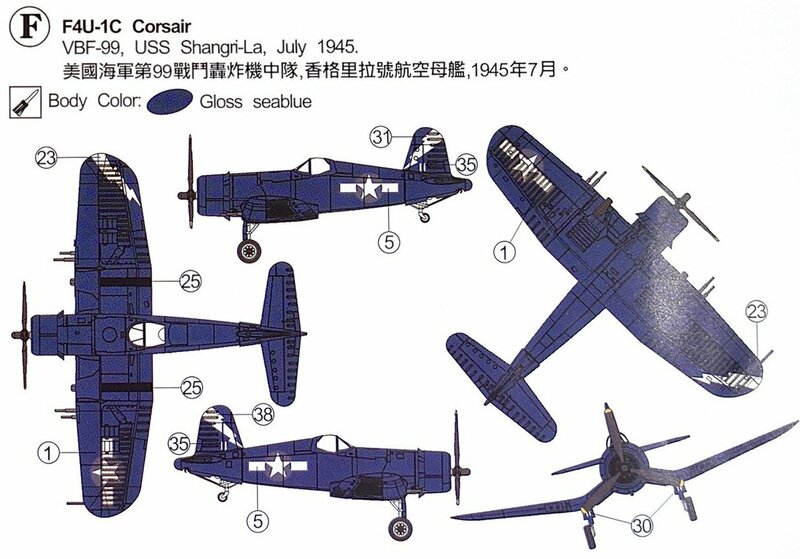 The Corsair served almost exclusively as a fighter-bomber throughout the Korean War and during the French colonial wars in Indochina and Algeria. F4U-1 (Fleet Air Arm-Corsair Mk I): First production version with the distinctive "birdcage" canopy. The Royal Navy's Fleet Air Arm received 95 birdcage Corsairs. 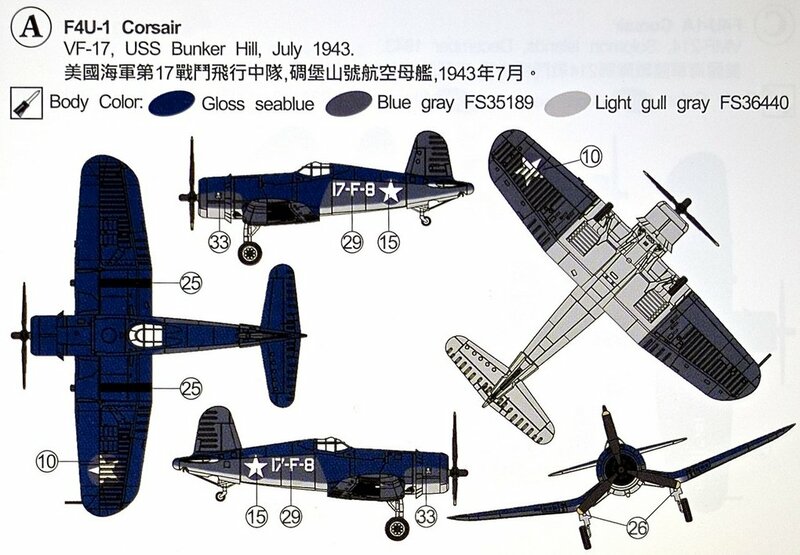 F4U-1A (Fleet Air Arm-Corsair Mk II): Mid-to-late production Corsairs incorporated a new, taller and wider canopy with only two frames along with a simplified windscreen. The designation F4U-1A was used to differentiate these Corsairs from earlier "birdcage" variants. 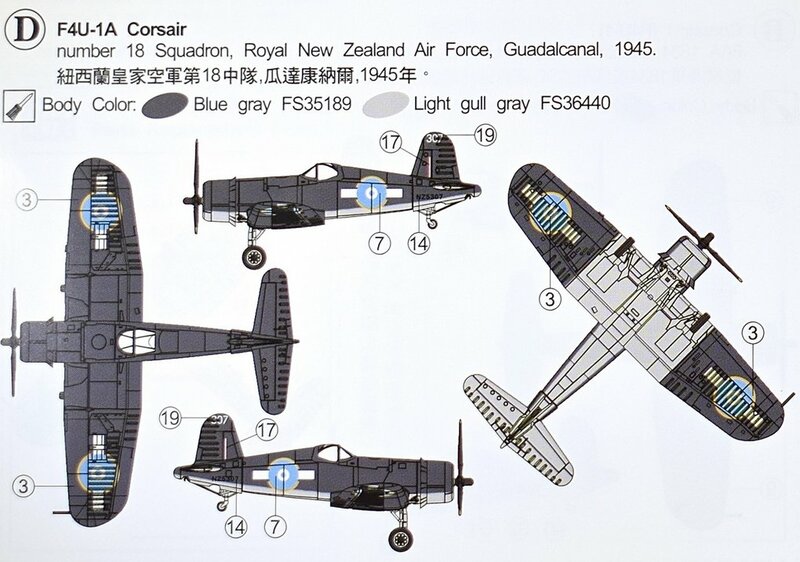 F3A-1 and F3A-1D (Fleet Air Arm-Corsair Mk III): The "F3A" denoted Brewster-built F4U-1's. Labor troubles delayed production, and the Navy ordered the company's contract terminated; they folded soon after. 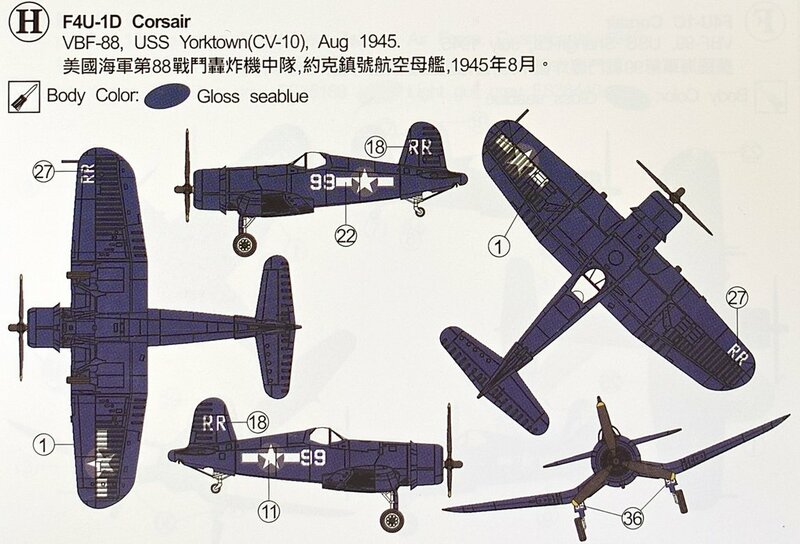 FG-1A and FG-1D (Fleet Air Arm-Corsair Mk IV): The "FG" denoted Goodyear-produced Corsairs built by, to the same specifications as Vought's Corsairs. F4U-1B: This was an unofficial post-war designation used to identify F4U-1's modified for FAA use. F4U-1C: Intended for ground-attack as well as fighter missions, the F4U-1C was similar to the F4U-1D except for its armament, which was changed from six machine to four 20millimeter (0.79 in) AN/M2 cannons. F4U-1D (Fleet Air Arm-Corsair Mk II): Had a new R-2800-8W Double Wasp engine equipped with water injection giving the aircraft a 250 hp (190 kW) boost in power and increasing speed from 417 mph (671 km/h) to 425 mph (684 km/h). 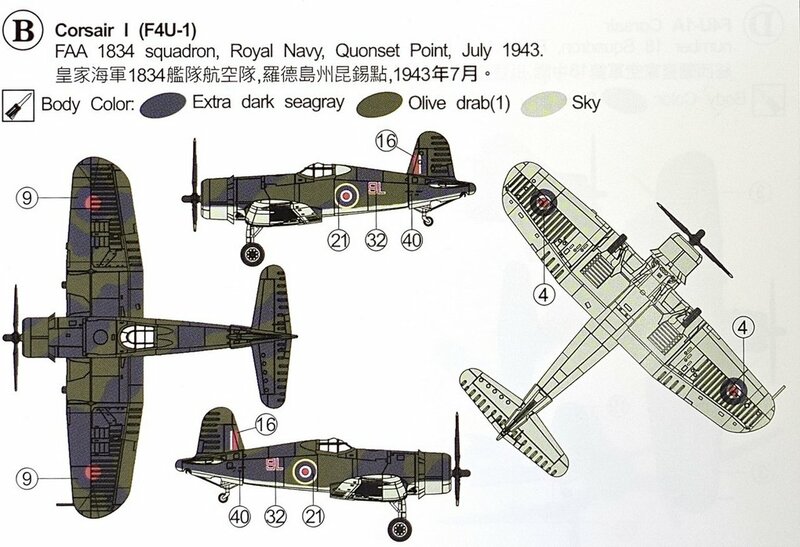 Additional modifications included underwing armaments (rockets/bombs) and the ability to carry drop tanks. 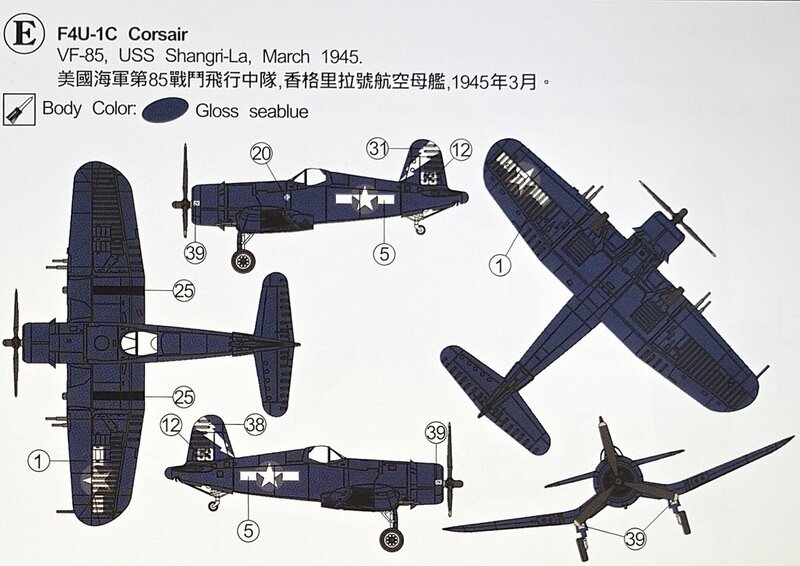 A single piece "blown" clear-view canopy was adopted as standard equipment for the -1D model and all later F4U production aircraft. 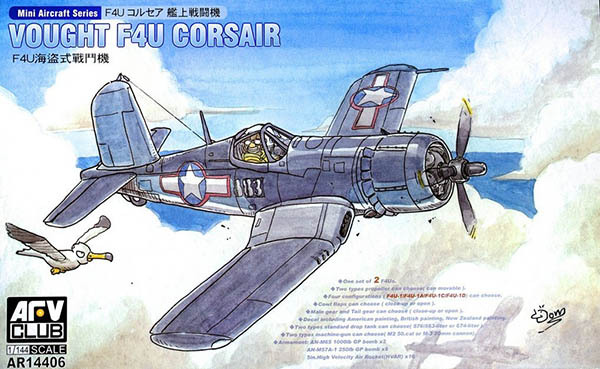 F4U-4: Last variant to see action during World War II: the F4U-4. The aircraft required an additional air scoop under the nose and the propeller was changed to a four-blade type increasing maximum speed to 448 miles per hour and climb to 4,500 ft/min. 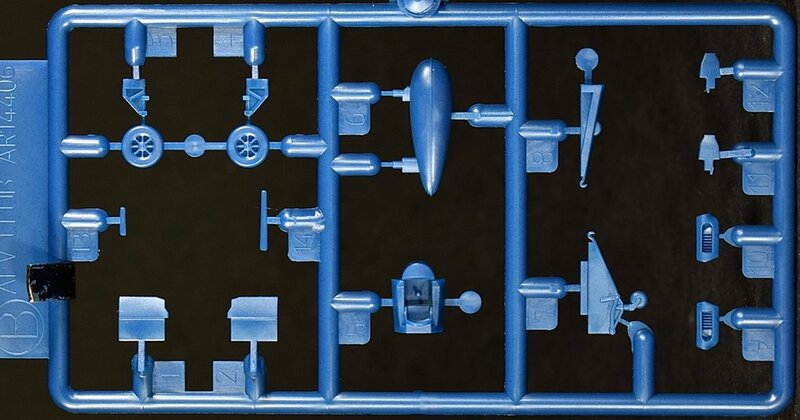 The end-opening box contains three sprues (x2) of blue injected styrene, one clear sprue with three canopies, and one decal sheet with markings for eight aircraft. All are individually bagged. All the parts have petite inscribed details. 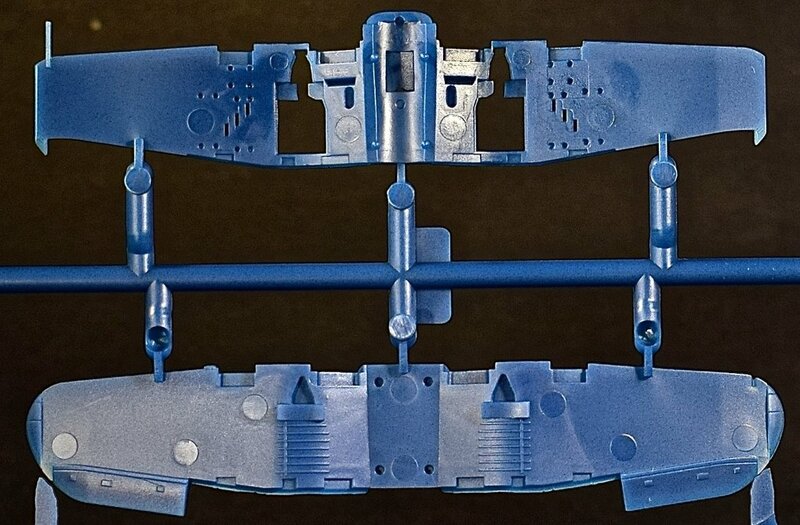 The fabric-covered control surfaces have ribbing that will look very convincing after painting. Likewise, the fabric-covered sections of the main wing are well done. 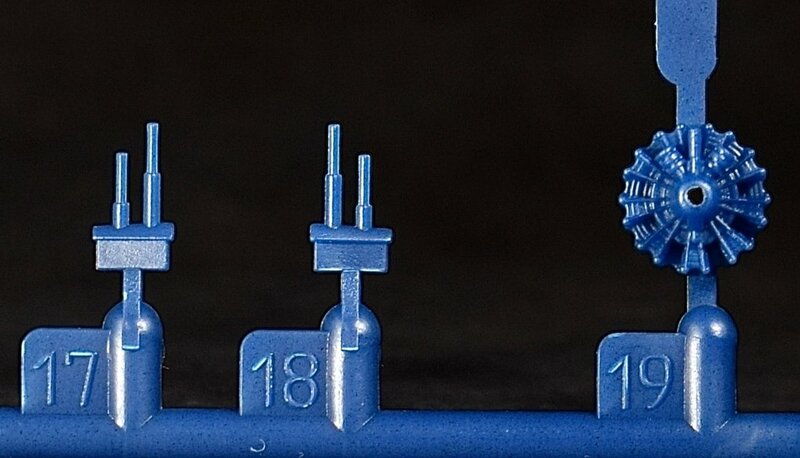 There is practically no flash and the sprue attach points are small facilitating damage-free removal. 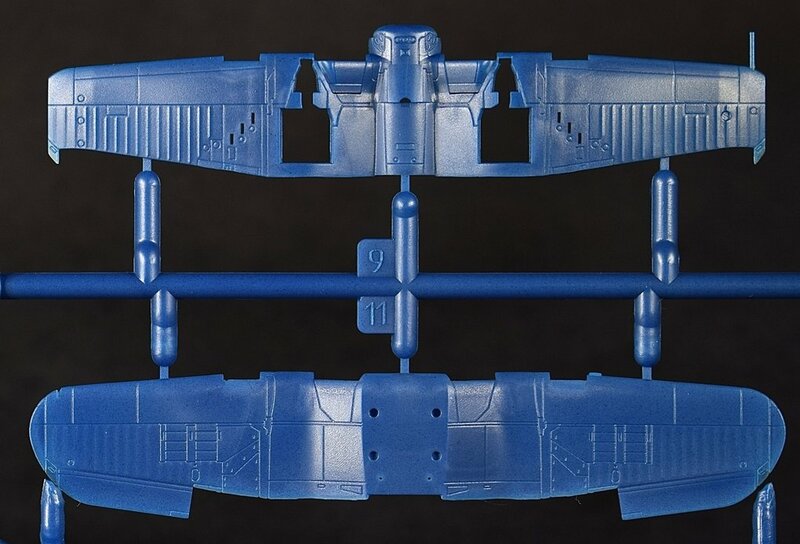 The kit has a conventional layout with the fuselage provided as left and right halves and the wing comprised of two, full-span pieces. 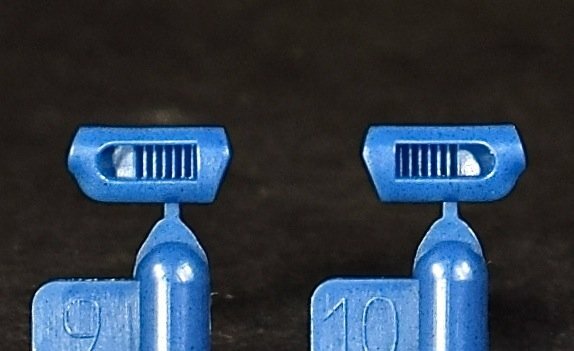 Adding to the crispness of the model are individual parts for the wing leading edge intakes. 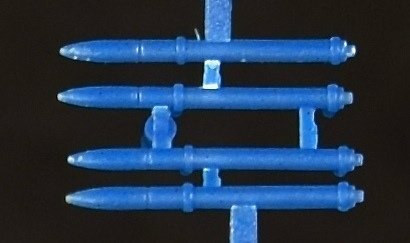 Similarly, the kit provides inserts for either the 6-gun or cannon-armed versions. A single-piece horizontal stabilizer/elevator piece completes the empannage while the flaps are provided as individual pieces: very nice. 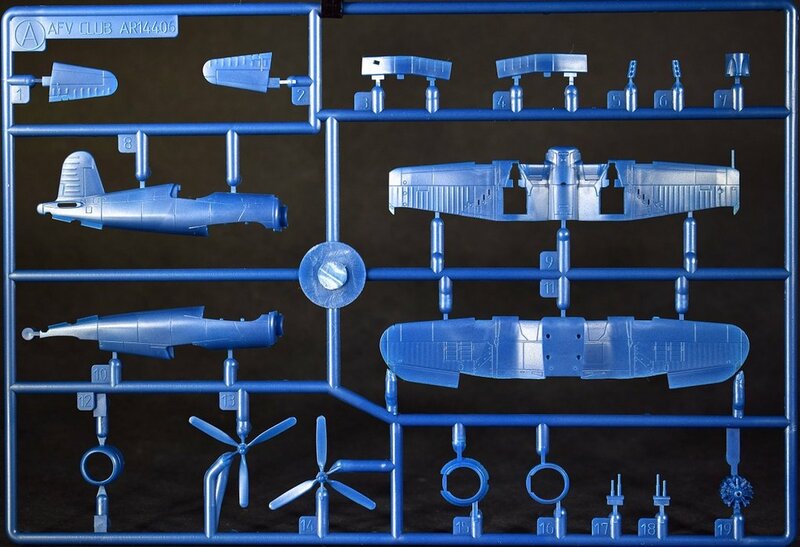 An amazingly detailed one-piece engine which, will look great after some carefull paint work and washes, is provided along with parts to build the model with opened or closed cowl flaps. In addition two different propellers are provided for either the F4U-1/1A or F4U-1C/D. 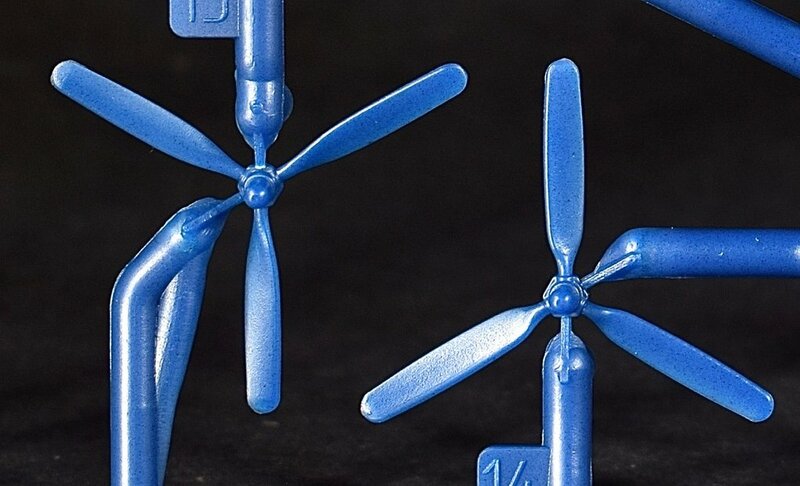 The landing gear parts are cleanly molded and sufficient to build the model in-flight or with the gear extended. The stores and armaments provided with the kit are truly impressive. 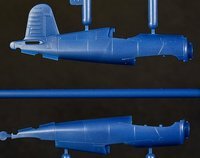 In addition to a centerline drop tank, rockets, bombs, and two wing drop tanks are included. 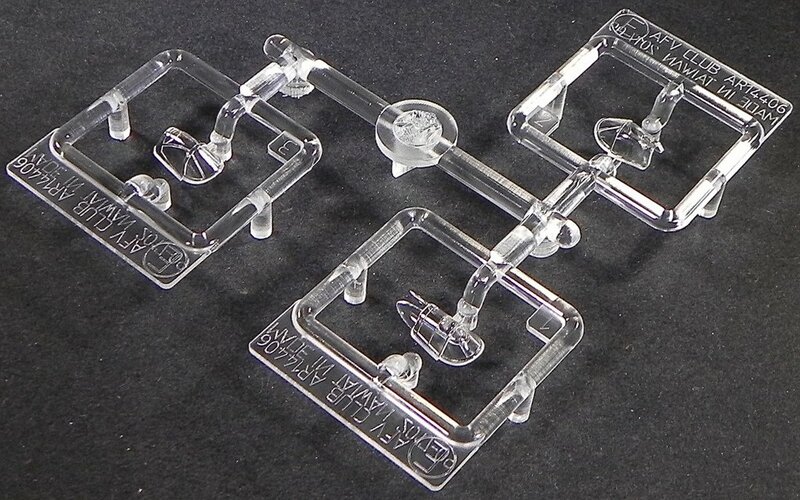 All three canopy parts are crystal-clear with crisp, scale appropriate framing. Canopies are provided for building a birdcage F4U-1, an F4U-1A, or either an F4U-1C or D.
A) F4U-1, VF-17, USS Bunker Hill, July 1943. B) Corsair I (F4U-1), FAA 1834 Squadron, Royal Navy, Quonset Point, July, 1943. C) F4U-1A, VMF-214, Solomon Islands, December, 1943. D) F4U-1A, Number 18 Squadron, Royal New Zealand Air Force, Guadalcanal, 1945. E) F4U-1C, VF-85, USS Shangri-la, March 1945. F) F4U-1C, VBF-99, USS Shangri-la, July 1945. G) F4U-1D, VF-84, USS Bunker Hill, February, 1945. H) F4U-1D, VF-88, USS Yorktown (CV-10), August, 1945. This is simply a beautiful kit full of crisp details. The straightforward engineering and conventional layout will make for a quick and pain-less build. The inclusion of three different canopies and an amazing assortment of underwing stores is very nice indeed. Once built, you've got eight interesting schemes to chose from: what's not to like? 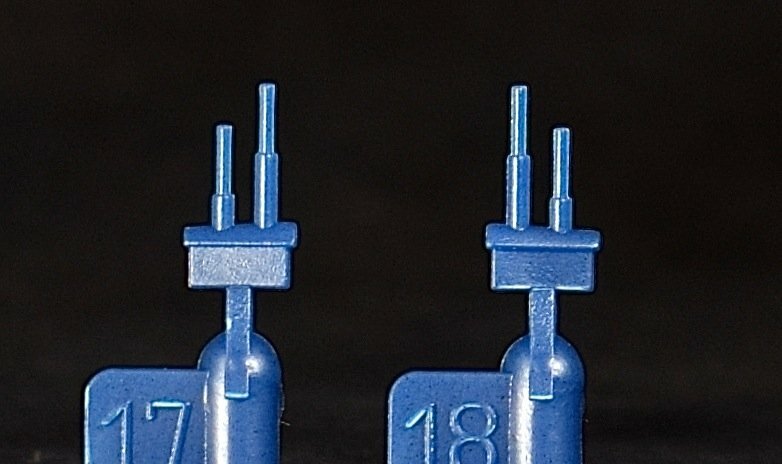 For more on this review visit Model Paint Solutions.